Food expos seem to be popping up like spring daffodils in the Upper Valley. OTK went outtathekitchen last weekend to one food fair where local culinary and pure food artisans introduced the public to their wares. Locavores and the food curious swarmed the hall and sampled their way through the 40 or so booths. 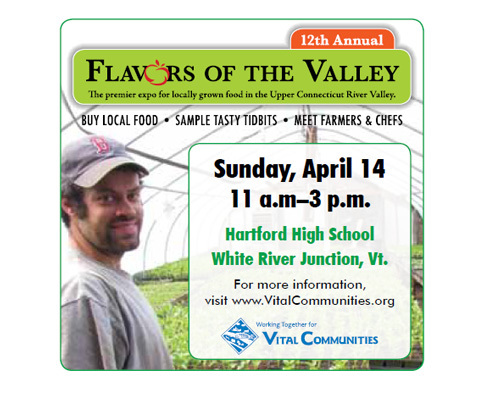 The event, sponsored by Vital Communities, a nonprofit serving the Upper Connecticut River Valley of NH and VT, champions the Valley Food and Farm effort of the region. From the valley’s fancy inns to the small home kitchen canners, food lovers gathered for the meet, greet, and eat. 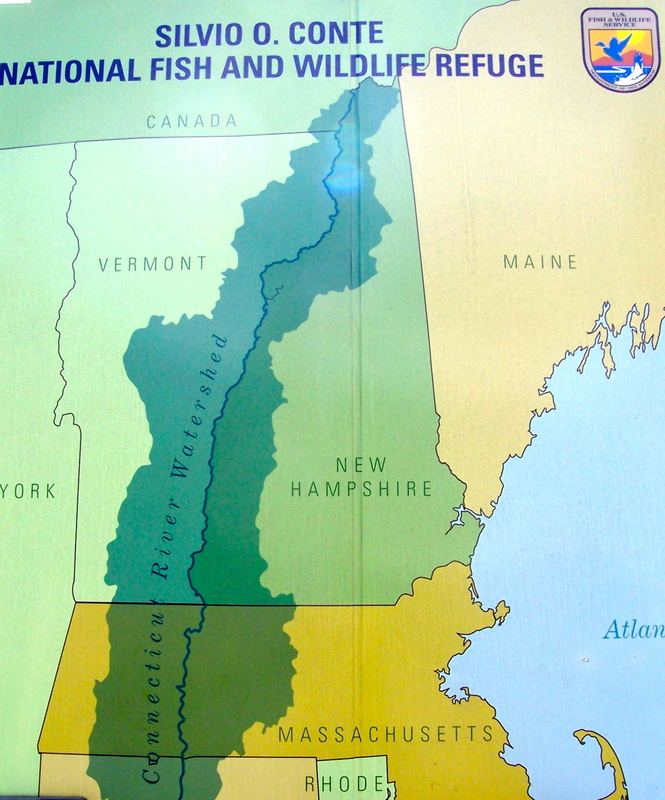 Near the long ticket line at the entrance, visitors enjoyed the attractive mobile museum of the National Fish and Wildlife Refuge, an educational exhibit on wheels all about the Connecticut River Valley watershed. Its interior, part museum and part fun-mobile for kids, contained educational displays about the natural habitat which thrives in the waters and on the shores of the river. And this gathering of hungry humans at the expo depends on the watershed, too, as this year’s Flavors of the Valley event proved. 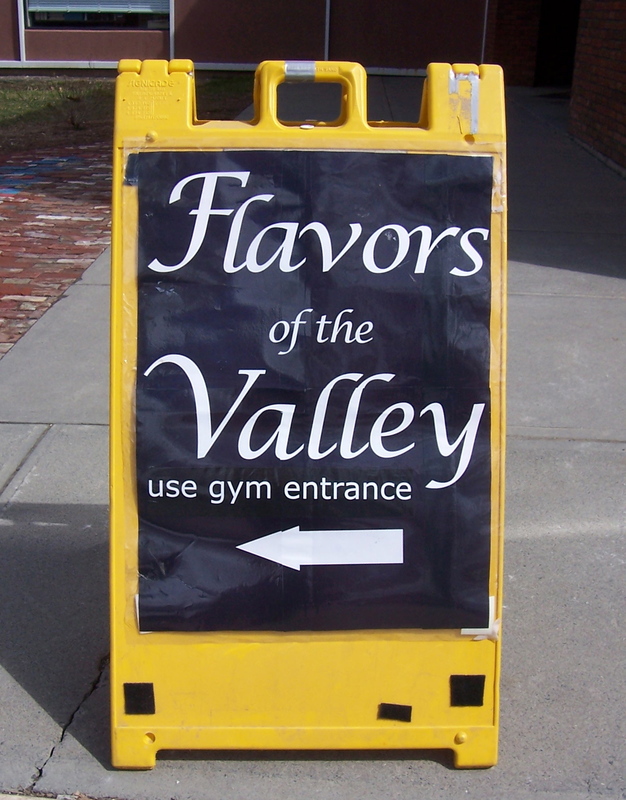 Navigating the crowded gymnasium was tough, but given the amount of free food being served up, visitors managed just fine. Many brought their own utensils for the samples and bellied-up to crowded tables where they were served tidbits of sausages, fresh whole grain breads, jams, jellies, and salsas; goat cheeses galore, unpasteurized milk and yogurts, and hot dishes from caterers; caramels and chocolates, too. 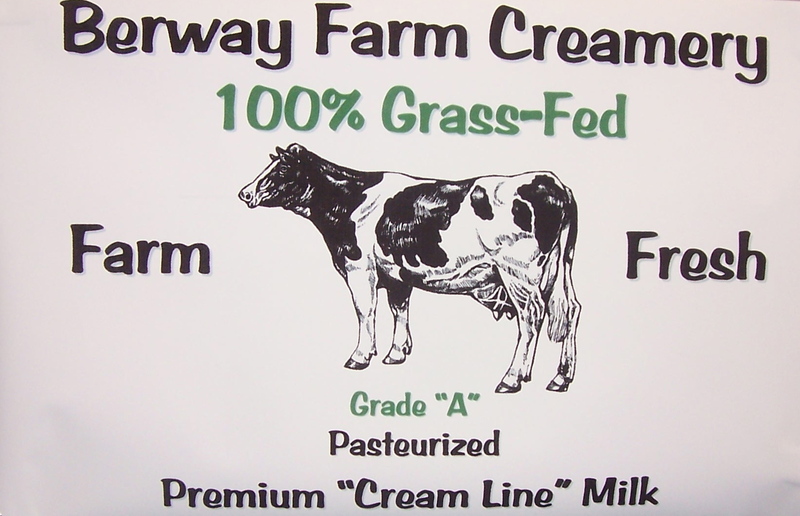 Dairy and meat products seemed to dominate– all-natural, organic purity was the theme. Squeezed between the food booths were local associations fighting pollution and land abuse, and plentiful information was available at booths promoting the expo’s business sponsors, such as the Hanover Coop. Flower and vegetable farmers reminded the public that planting was only a few weeks away, their mini-nurseries featuring seedlings along with purple and yellow happy-faced pansies. An earthy odor of their fresh loam mingled with the perfume of grilled spicy chorizo sausage. I had the pleasure of talking with one very creative home canner. 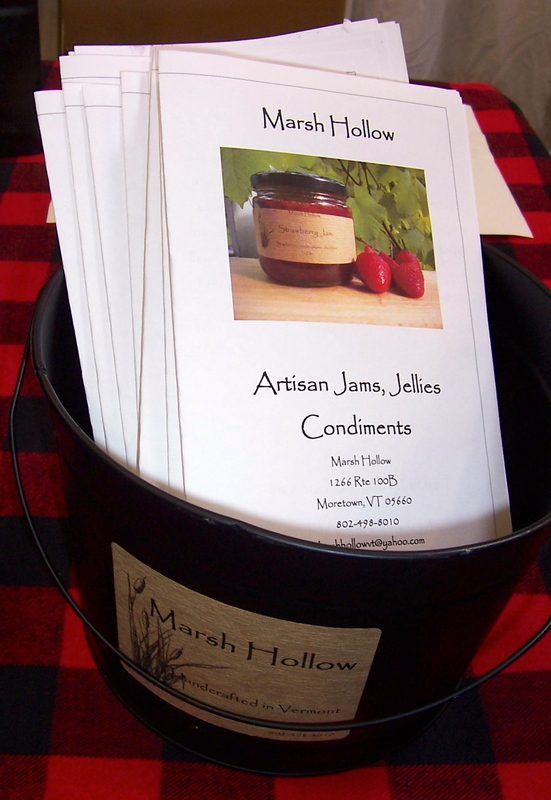 John Snell, a Moretown,VT chef and owner of Marsh Hollow artisan jams, jellies, and condiments, simply blew the competition out of the water. He describes his products as “non-traditional,” and the flavor combinations he designs are truly original in both concept and execution. 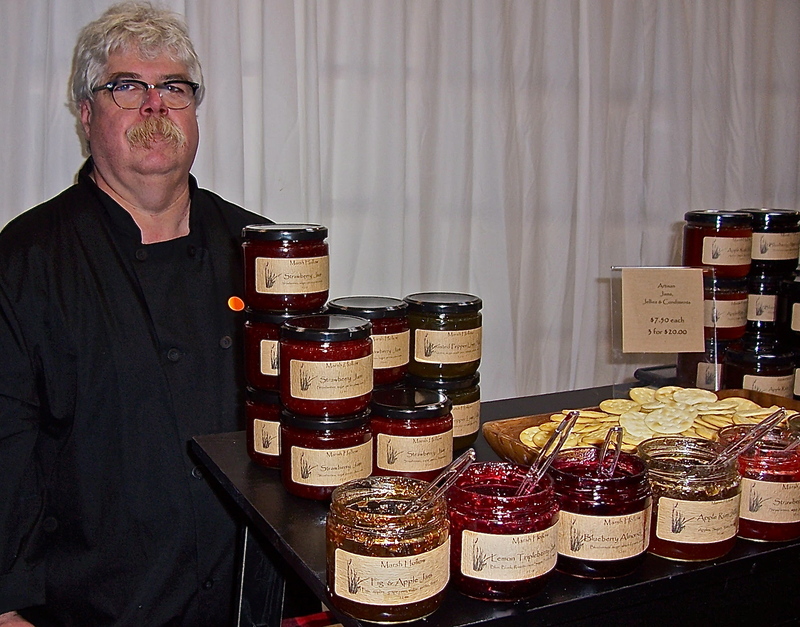 Sweet and savory, his freshly crafted and seasonally preserved jams and jellies are uncommon and produced in small batches. I strongly suggest the Blueberry Almond, especially added to yogurt. But then again, straight out of the jar rocks, too. Fig and Apple, devoid of that cloyingly sweet fig aftertaste common to many fig jams, brings together Italy and New England. 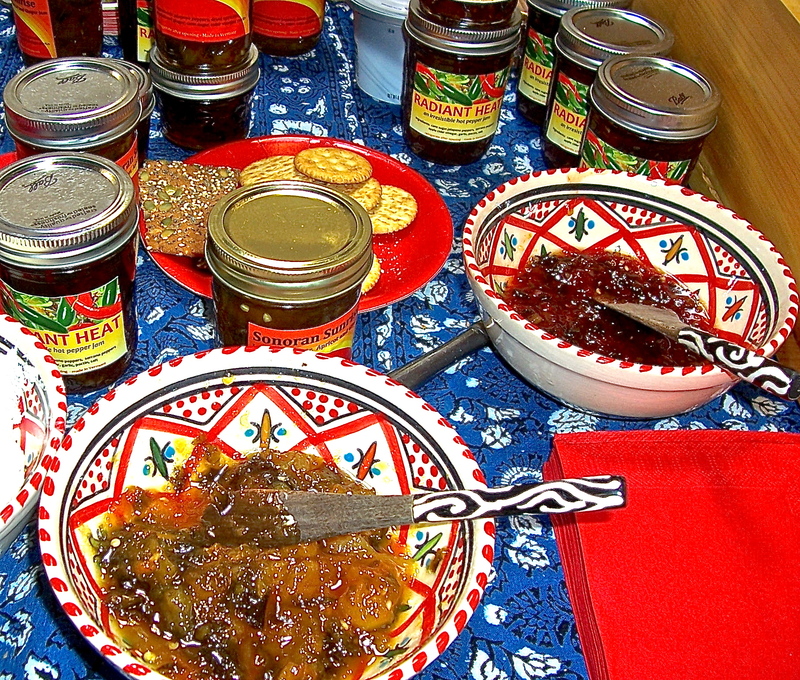 There’s Irish Beer Jelly, Bruschetta, and my hands down favorite– Roasted Pepper Lime Jam. He plays around with rhubarb and carrots and pumpkins, too. Sampling these condiments sent my own creative recipe juices flowing, and I am looking forward to using them in fruited tangy sauces for venison, duck, and turkey this fall as well as filling my delicate cupcake confections with frostings and creams incorporating Marsh Hollow artisan jams, jellies, and condiments. You can also order up delivery of a Jam of the Month. If you join this condiment club, the shipping is free, and the featured flavors include his regular line along with whatever is seasonal– or better yet, John’s latest inventive combination of seasonal produce– which is exactly what inspires a truly fine chef like John. 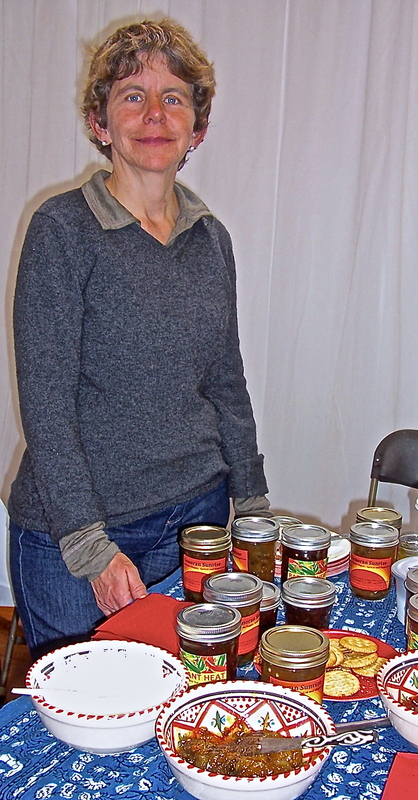 Perched at the end of Bee and The Baker’s table of organic breads (all baked in a hand built oven), was newcomer nurse-turned-home-canner, Barbara Badgley of Fairlee, VT, who offered a finely crafted line of hot pepper jelly called Radiant Heat. This was her debut, and boy, what an entrance. These hot pepper jellies are composed of serano and jalepeno peppers from her own garden. Unlike most pepper jellies that feature a sweet viscous base with pepper flakes, her jellies are packed with garden fresh miniature peppers in a tangy jelly and a generous level of heat. Sampling this product was like walking into a garden of flavor as the peppers were so very fresh and kept their integrity. The product is somewhere between a salsa and a jam and a pickle. I went home with the Sonoran Sunrise Jalapeño Pepper with Apricot and Ginger and Radiant Heat’s Irresistable Hot Pepper Jam. No joke! Barbara is looking forward to planting some heirloom variety peppers this year. I think it was a great day for Barbara, and I loved her aspirations for the upcoming season. Attending this sort of expo is dangerous for I am once again seriously contemplating raising chickens in my backyard. Having gorged on beer cheese, home made pastas, artisan organic butters, honey and maple syrup-based candies, I left Flavors of the Upper Valley with quite a few dreams of my own– for my garden, for my cooking, and for the continued success of these local farmers and chefs. And the parallel efforts of conservationists of the region make for a wonderful marriage with the creative culinary dreams of the people in this region. 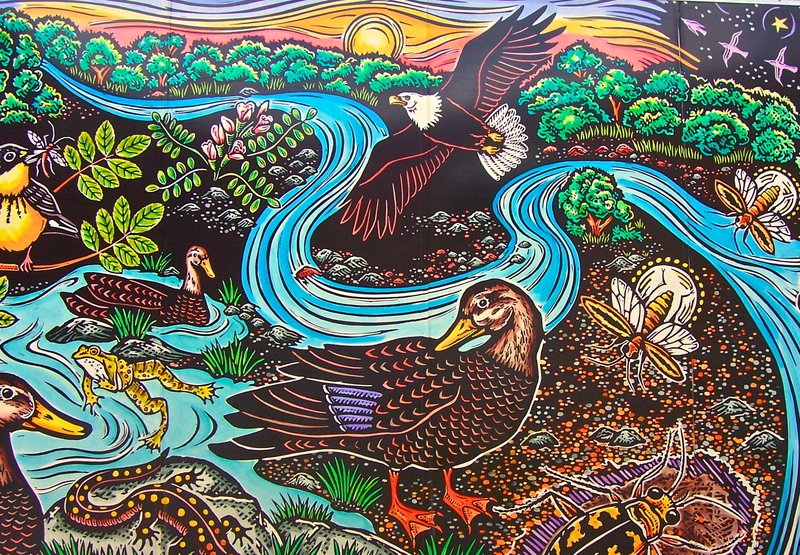 The continued environmental health of the surrounding Connecticut River Valley must never be taken for granted as it remains the foundation of the bounty enjoyed by all in the region. The alliance of foodies, farmers, environmentalists, and local business will keep important issues and sustainable agriculture on the front burner. As the the winter storm Nemo was drifting out to sea, chef instructor Melanie Underwood was on the phone doing damage control. The epic storm had delayed a major cookie dough delivery from Jacqueline’s Bakery in Massachusetts that she was counting on for the volunteers gathering to bake that afternoon for the international non-profit called Cookies for Kids’ Cancer. Underwood, an instructor at New York City’s Institute for Culinary Education (ICE) and a volunteer for the global bake sale fundraising organization, was intent on tracking down the dough and re-scheduling the bake-off to later in the day. The cookies were a big thank you to the Memorial Sloan Kettering Cancer Center for its role in pediatric cancer research and care. This grass roots and now world wide organization is a perfect mirror of Melanie Underwood’s own passion for how powerful the act of baking can be– a passion which eventually led her to a career as an instructor at the former Peter Kump’s New York Cooking School where she has worked for seventeen years. Growing up on a farm, Melanie’s childhood of collecting eggs, milking cows, and composting gave her a wonderful appreciation of where food comes from. Life on a Virginia farmstead surrounded by extended family, especially a grandmother who prepared a dessert daily with the fresh ingredients from the farm, gave her a firm foundation in baking. At a very early age she could fashion a pie crust from memory and whip up a mean pâte a choux. That joy of baking eventually blossomed into a job at a local bakeshop followed by brownie and cookie baking for the farmers market. Post-college, Melanie made her way to a Washington DC area hotel where she apprenticed as a volunteer working under a pastry chef and entered a number of pastry competitions. With French pastry techniques under her belt, she moved on to broaden her culinary experiences at the Four Seasons Hotel, the Plaza, and Torre de Pisa in NYC during the early 90’s. 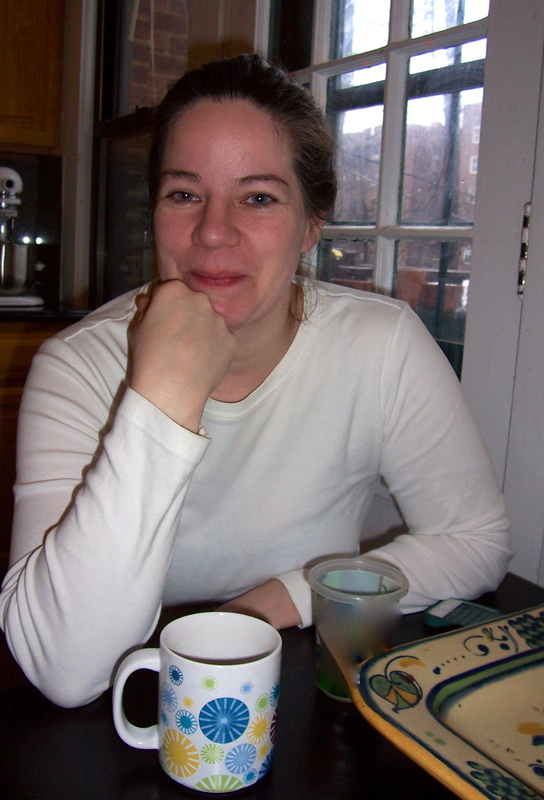 Eventually, Melanie’s experience, talent, and knowledge led to a position as an educator at New York’s Institute of Culinary Education. 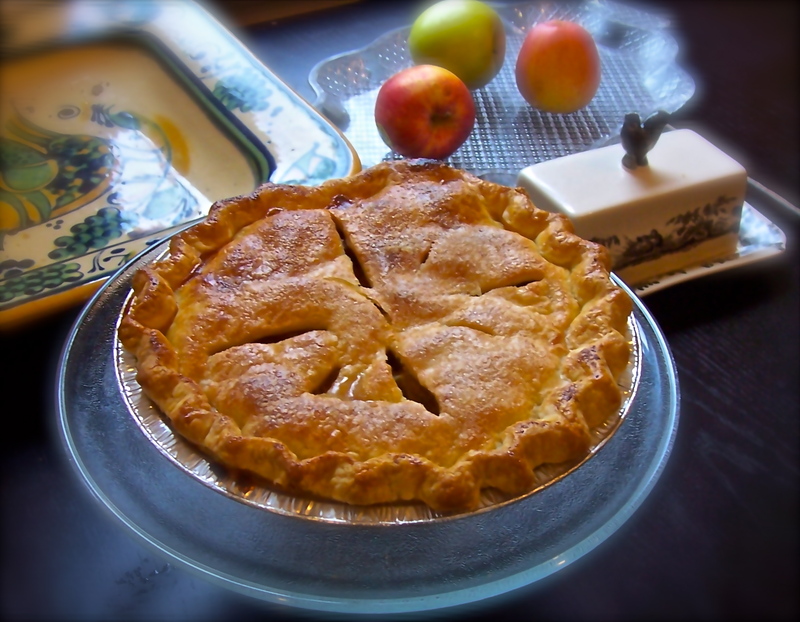 Interviewing Melanie at her home in Queens, I was served a memorable slice of apple pie as well as a colorful fruit tart with English cream. After enjoying dessert first, we concluded the interview with lunch– Melanie’s Pulled Pork and Kohlrabi Cole Slaw. Both recipes are found in the OTK’s RECIPES menu link. OTK: What is one of your fondest food memories? MUK: I made eclairs for my dad. He was out on the tractor. I prepared the pastry, the cream, and the chocolate sauce. I ran across the field and presented it to him on the tractor. I was so proud, and I think that was key. Experiences like that build confidence. Many people are much better cooks than they realize. Confidence in cooking is primary. OTK: How would you describe the students you teach? MUK: I teach adults mostly. My mother and daughter courses are also very popular. I often teach absolute beginners, couples, and career chefs, too. OTK: What do you think contributes most to developing a person’s interest and understanding of food? MUK: It’s starts at a young age. I wonder if people really let kids fully into their kitchen. A lot of values are taught in the kitchen along with knowledge about food and cooking. I have two kids. My oldest is 15, and he often cooks for himself. He even makes cheese for his pizza. My kids are comfortable in the kitchen and are good eaters. They’ve eaten anchovies out of the jar since they were little! OTK: What do you feed your own family? MUK: I make them pancakes practically every day. I like grilling and braising, especially pulled pork. As much as I can, I go chemical and antibiotic free. It’s better for the environment. I grew up on a farm. I’m not into starch much. My starch growing up was mostly lima beans! OTK: How would you describe the difference between cooking and baking? MUK: I trained as a baker, but I found that when I started cooking, it totally opened up another side of my personality. With baking you have to measure, be precise. 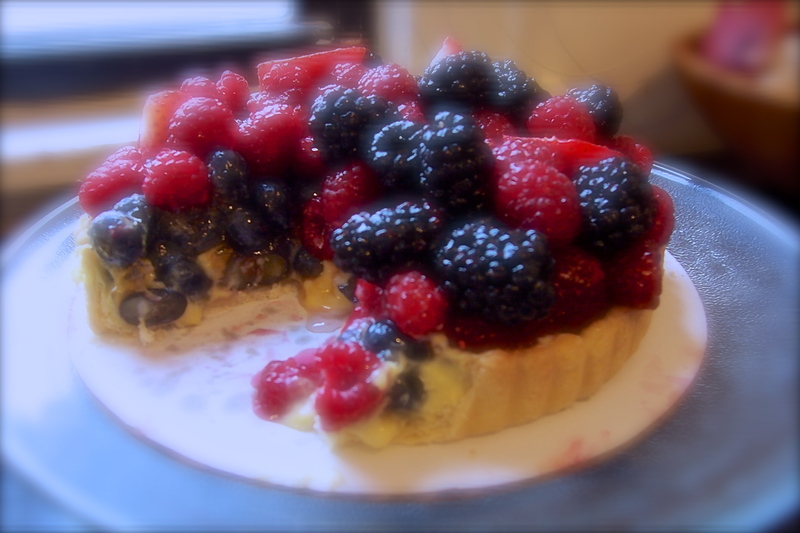 Cooking is more flexible, even though I feel more creative when I am baking. I think cooking made me a better person and broadened my skills so I did not get stuck in a rut. OTK: What was it like working in the big hotels? MUK: When I was at the Four Seasons, we all did everything. 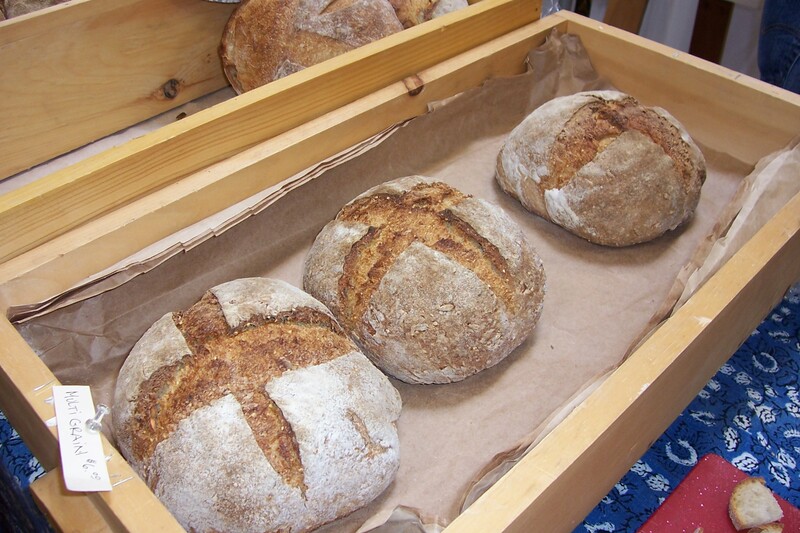 When I was in the bread bakery, I scaled the dough and learned to be exact each time. I was exposed to all levels of preparation of bread and pastries. The bakery tasks and production were all divided up based on the day’s pastry menu. All the amenities were prepared as well as the specialities, and then on the pastry line every dessert was made to order and assembled with emphasis on food styling. There is a real hierarchy mindset, typical of training in a big hotel kitchen. The executive chef is like the CEO of the kitchen. OTK: What inspires you to cook? MUK: I draw my creativity from everyday life, but it is hard to pinpoint. Single ingredients can be inspirational. When I was at the Four Seasons, we prepared a dinner where all the courses featured tomatoes. I love lemon, especially preserved lemons and Meyer lemons. Citrus, in general is a favorite of mine. And I am inspired by my microplane! You can grate so many things with it– like lemon zest and grated chocolate. You can’t over zest. I also love to go to the market for inspiration. Sometimes I put all the seasonal produce from my CSA (Community Supported Agriculture) out on the table and come up with fun new recipes. OTK: Have you ever considered opening a restaurant? MUK: People ask me that all the time. Only if someone else will fund it and get up at 3:00 in the morning! I love teaching and being a culinary educator. OTK: As a culinary educator, what are the goals you have for your students? 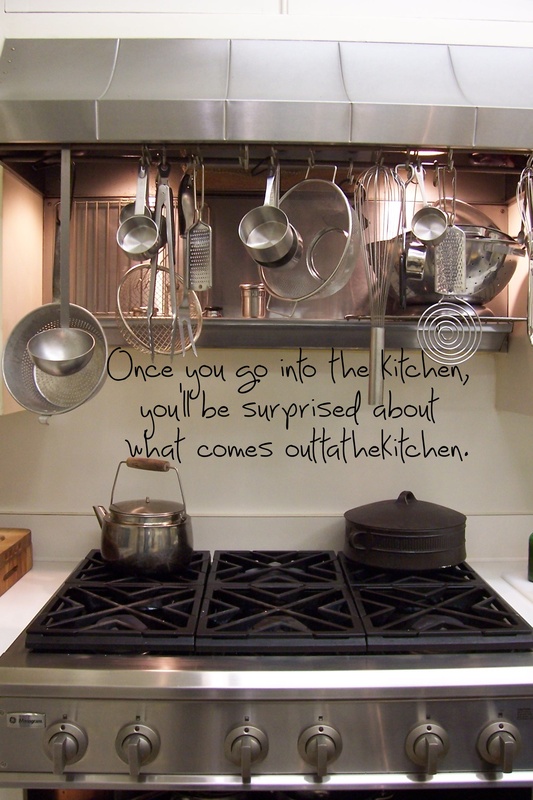 Do you have specific expectations of your students in the kitchen classroom? MUK: First, I want my students to be respectful of food. I insist that they try their wares. I also want them to get over any performance anxieties and learn to work in teams. I ask them to share why they are taking the class. Some of my students are not really comfortable in a kitchen yet, and that is why they are taking the course. There are lots of group dynamics and sometimes people’s insecurities and anxieties can come out so I provide lots of positive reinforcement. It can be fun to cook with others, but I also want them to have individual confidence and, most of all, to have fun. Ultimately, I want them to learn to cook without using recipes, so I tell students in the 12 week classes that it is important to practice at home in order to get better. It’s like learning a language. I give them various exercises to do at home. Other advice is “clean as you go.” Also, I tell students to invest in a good scale. I just want them to relax and have a good time. When you take the time to cook for others, they are not going to judge you. OTK: Do you teach much about the science of cooking and about technique? MUK: I do include some, but I really focus on hands-on learning. Pastry classes often require more information about technique. Some students really want (and need) to know why certain chemical reactions are happening and are quite interested in the science behind the art. But experience is the best teacher. OTK: What are some of your favorite cookbooks? MUK: I love the more traditional Fannie Farmer Baking Book. I like instructional books. I also like the Heidi Swanson 101 Cookbooks that emphasize healthy eating and Mark Bittman’s How To Cook Everything: Simple Recipes for Great Food. I prefer any cookbooks that are informational and have an instructional bend. OTK: If you were to write a cookbook , what would it be about? MUK: Cupcakes. It would be recipe driven and technique based. Cupcakes are still extremely popular, and my class on cupcakes is selling out like crazy with waiting lists. OTK: Do you have a favorite style of cuisine? MUK: For eating, authentic Indian cuisine. I have a lot of talented Indian friends. 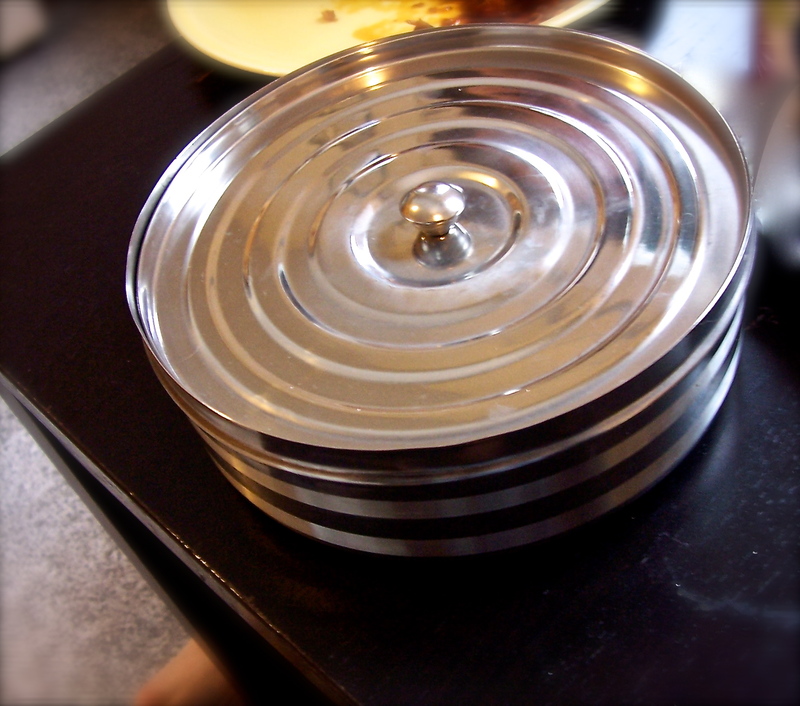 I want to be able to cook Indian food and to use my new masala dabba and make my own curries. I love southern food, but I don’t cook in the specific southern style. A lot of my cooking is French based due to my training. OTK: How would you sum up your philosophy for good eating? There is a connectivity between cooking and life. When you grow up on a farm you see how growing, cooking, and recycling scraps into compost that you then use to plant more food or use to feed the animals is a life cycle. Today it’s harder for kids to make this connection to where our food comes from, but they can find it, for example, at a farmers market. And I think teaching baking and cooking makes that connection for everyone. Before my departure, Melanie learned that the cookie dough was en route and would arrive in the late afternoon. The volunteers assembled at 5:00 to bake and package the treats for the hospital.